Search Results for "paddle boarders"
Cool overhead zoom-in shot of a group of paddle boarders paddling out in the Atlantic ocean. Rack focus to 3 paddle boarders paddling away from camera on river near city. Aerial of stand up paddle boarders paddling around on a calm sunset evening, camera tracking toward the right at Bloubergstrand beach, Cape Town, South Africa. Aerial approach and fly over Bloubergstrand beach with Stand Up Paddle Boarders paddling around on a beautiful evening at sunset with iconic Table Mountain in the background, Cape Town, South Africa. Aerial Drone Shot of Two Paddle Boarders Pulling Back to Reveal a Beautiful River and Landscape. Aerial Panning Drone Shot Following Two Stand Up Paddle Boarders at Twilight. Aerial Drone Shot Moving Behind a Group of Stand Up Paddle Boarders Before Pulling Up to Reveal a Beautiful Landscape. Overhead Aerial Drone Shot of Two Stand Up Paddle Boarders in a Picturesque Setting. 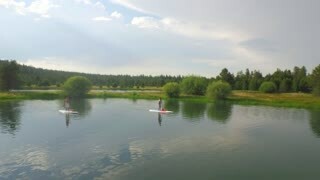 Two Adult Paddle Boarders on a Relaxing Adventure Down the River at Twilight. Aerial footage of snorkelers and stand up paddle boarders at the north reef of Keawakapu Beach. Maui, Hawaii. Paddle boarders wading through the ocean off the Jurassic Coast in Seaton, United Kingdom. SEATTLE, WASHINGTON/USA - APRIL 27, 2015: Aerial Two Paddle Boarders on a Lake in Seattle Downtown. Tempe, Arizona, USA - June 24, 2015: Town Lake, Paddle boarders floating down the lake. Stand up paddle boarders 4K. Two young men paddleboard at Point Lookout, New York. Shot with PANASONIC GH4 in 4K UHD with natural sound. Overhead Aerial Drone Tracking Shot of a Group of Stand Up Paddle Boarders. Panning Drone Shot of a Small Group of Stand Up Paddle Boarders. Arial view of railway bridge, Kayakers & Paddle boarders underneath. Cool overhead orbit of a large group of paddle boarders splashing. Stuning aerial drone footage of fast fishing boat heading out to the ocean, as it passes another boat and several standup paddle boarders.